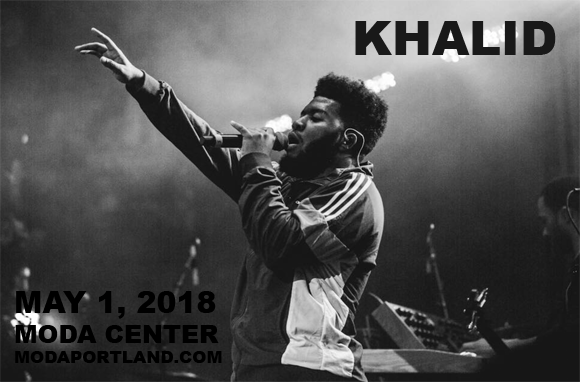 The excitement is building at Moda Center as Grammy Award-nominee and RnB rising star Khalid is coming live! Get ready for the main event on Tuesday 1st May 2018, when the singer will be performing songs from his smash hit album American Teen! Tickets available now! American singer-songwriter Khalid first came to public attention when he reached number 2 on the Billboard Twitter Emerging Artists chart in July 2016. Throughout 2016, Khalid was featured in many publications, including Billboard, Yahoo, Buzzfeed, and Rolling Stone, and his single, “Location”, peaked in the Top Ten of the Billboard Hot R&B Songs chart in January 2017. After collaborating with Logic and Alessia Cara on the track "1-800-273-8255", Khalid released his debut studio album, American Teen, on March 3, 2017, recieving critical acclaim and Grammy Award nominations for Best Urban Contemporary Albumand Best R&B Song (for "Location"), at the 2018 ceremony.